Happy Giving Tuesday! Now that Thanksgiving is over (it’s OK if you don’t want to eat any more turkey) and we can stick a fork in the unofficial shopping holidays, it’s time to get back to basics: supporting the people, places, and things that we care about. Giving Tuesday is a global day of giving fueled by the power of social media and collaboration.! And we’re asking you to “Give the Gift of Ohio Lit” today by supporting the Ohioana Library. Every day, because of you, Ohioana connects readers and writers, bringing the joy of literature and storytelling to so many people through our outreach, awards, collections, and publications. We want everyone to know about the great work done by so many dedicated artist and writers; creative individuals with a strong Ohio connection. We want everyone to know the stories of Ohio’s people and places. And when you give, you make it happen. 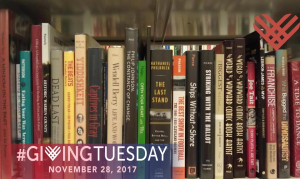 Please help to Give the Gift of Ohio Lit, and put Ohioana on your list for giving today!